A SURGE in popularity of the share economy has prompted one specialist training company to apply the concept to its business model. The principle, also known as collaboration economy, utilises assets or facilities to their full capacity and avoids wasting valuable resources while idle. Brisbane-based Construction Training Centre (CTC) launched the venture known as hot leasing, to reinvent how Registered Training Organisations (RTOs) conduct courses. The campus-style facility in Salisbury is the first of its kind, offering short-term use of training rooms and equipment for RTOs on a pay-per-use basis - avoiding unnecessary capital outlay. CEO Phil Diver (pictured) says a paradigm shift by generation Y propelled the idea, with technology-savvy youth happy to stream music while baby boomers like to purchase the physical album. “You don’t have to take a lease out any more, you don’t have to buy a forklift or build a $160,000 heights training simulator, just pay for the days that you actually use it. “We’ve built the specifications to a high standard whereas when starting a facility, chances are you’re not going to have enough money to make it the best in class,” he says. The CTC had the idea in mind for some time, with the hot leasing facility taking 12 to 18 months to develop. “Because no one has done one before, we spoke to a lot of people in the industry and gathered suggestions if money was no object and we incorporated those ideas. Diver says the experience is customisable and tailored to brand identity, with RTOs able to set up signage to retain their “boutique-feel” while sharing the space with other users. 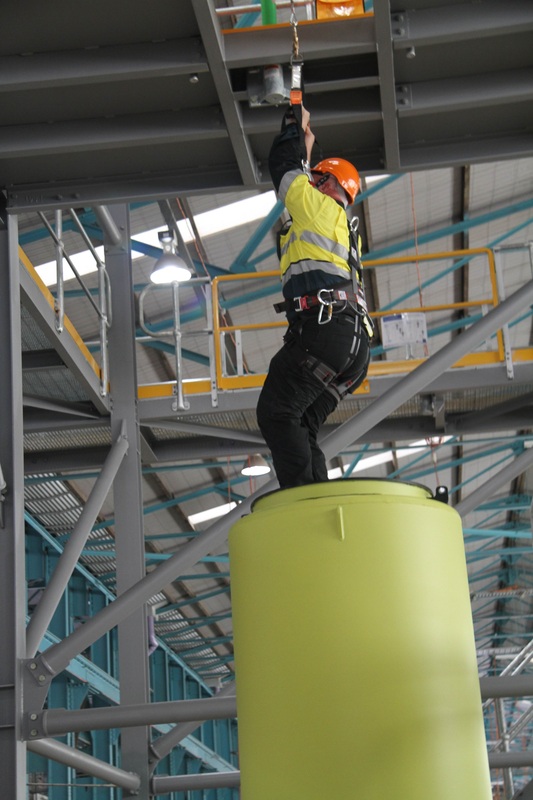 The CTC caters to a number of training requirements, including crane safety, forklift licenses, heights training and confined spaces. “We have one of the few swing-stage simulators in place, for window cleaners and painters to scale the side of a building. Diver is pleased with the response from clients, seeing take-up from a number of outlets – not just high-risk industries requiring safety training. “Asbestos is quite popular at the moment because the rules around asbestos training have changed. The business model is proving to be popular for RTOs as well as rival businesses, with some competitors doing some “not so secret” shopping. “We’re very transparent about that because pricing is pricing, you have to announce it – we’re proud of what we’ve put in place and whether others are able to replicate it remains to be seen. “We have an early to market advantage with a well-advanced marketing campaign behind it. There’s a lot of brand identity with hot leasing now. Diver anticipates further growth next financial year, as customers commit to the concept rather than alternatives. He says the share economy is set to boom, following the emergence of crowdfunding, digital currencies and various apps expanding the landscape.